A big problem arises when taxpayers fail to consider that acquisition debt steadily declines over the life of the loan. So, for example, if the original acquisition debt was $400,000 and you refinance 15 years later, the acquisition debt has probably been paid down to somewhere around $300,000. In this case, if the loan was refinanced for $475,000, the refinanced debt would be allocated $300,000 to acquisition debt, $100,000 to equity debt and $75,000 to debt for which the interest would not be deductible as home mortgage interest. In this case, the interest paid on the $300,000 acquisition debt and the $100,000 equity debt would be deductible as home mortgage interest. If the use of the $75,000 can be traced to another deductible use (e.g., purchase of taxable investments or expenses related to operating a business), then the interest on the $75,000 loan would be deductible per the limitations of the other deductible use. If the use of the $75,000 cannot be traced to an interest-deductible use, then the interest would not be deductible. In general, beginning January 1, 2015, employers with at least 100 full-time and full-time-equivalent employees must offer affordable health coverage that provides minimum value to at least 95% of their full-time employees and their dependents or they may be subject to an employer shared responsibility payment. This payment applies only if at least one of the employer’s full-time employees qualifies for a premium tax credit through enrollment in a government Health Insurance Marketplace. Generally, an employer is subject to the requirement to provide affordable health coverage in 2015 if the employer has 100 or more full-time employees. When determining the number of full-time employees, there are certain classes of employees that are excluded from the count—the most notable being certain seasonal employees. Although an employee is considered full-time if he or she works 30 or more hours per week, to determine if the employer has reached the 100 full-time employee threshold, part-time employee hours for a month are totaled and divided by 120, and the result is added to the full-time count. Thus, an employer with fewer than 100 full-time employees may be required to provide an insurance plan to the employer’s full-time employees if the combination of full-time employees and the hours of part-time employees equal the equivalent of 100 full-time employees. The foregoing is an abbreviated overview of the employer insurance mandate. The rules are complex. If you are unsure whether or not your business is subject to the penalty for 2015, please give this office a call. Don’t delay: the penalties are substantial and in some cases may be higher than the cost of the insurance. Individuals can deduct as miscellaneous itemized deductions certain expenses that they incur in the course of their employment. Generally, qualified business expenses are un-reimbursed expenses that are both ordinary (common and accepted in your industry) and necessary and do not include personal expenses. Utilize the Section 179 Deduction – Generally, business assets with a useful life of more than one year must be deducted (depreciated) over several years. However, most business assets, other than real estate, qualify for the Code Section 179 expense deduction that allows the entire cost (up to $25,000 for 2015) to be deducted in one year. While vehicles used for business are eligible for Section 179 expensing, other limitations cap the deduction at lower amounts. The depreciation or Section 179 deduction of an employee’s business assets is part of employee business expenses subject to the 2%-of-AGI floor. However, by claiming the Section 179 deduction in the year the asset is purchased rather than deducting a lower depreciation amount over several years, there is a greater chance that the total miscellaneous deductions will be more than the 2%-of-AGI floor, thus allowing part of the expense to be deducted. If you would like to explore any of these techniques, please give this office a call. If you own real property that you could sell for a substantial profit, you may have wondered whether there’s a way to avoid or minimize the taxes that would result from such a sale. The answer is yes, if the property is business or investment related. Normally, the gain from a sale of a capital asset is taxable income, but Section 1031 of the Internal Revenue Code provides a way to postpone the tax on the gain if the property is exchanged for a like-kind property that is also used in business or held for investment. These transactions are often referred to as 1031 exchanges and may apply to other types of property besides real estate, but the information in this article is geared toward real property. The property must be given up and its replacement must be actively used in a trade or business or held for investment, so a personal residence or a vacation home won’t qualify. However, under some circumstances a vacation home that has been rented out may qualify. The properties must be of like kind. For instance, this means you can’t exchange real estate for an airplane. But the definition is quite broad for real property – for example, it is OK to exchange raw land for an office building, a single-family residential rental for an apartment building, or land in the city for farmland. Typically, the owner of a residential rental who participates in an exchange will trade for another residential rental. Both real estate properties must be located in the United States. Caution: Stocks, bonds, inventory, partnership interests and business goodwill are excluded from Sec 1031 exchanges. It is unusual for two taxpayers to each have a property that the other wants where they can enter into a simultaneous exchange. Most likely, if you wanted to exchange your property, you may need to do a “deferred exchange,” which means you effectively sell your property and then find a suitable replacement property. In this case, the law is very strict. You must identify, in writing, the replacement property within 45 days of the date your property was transferred and complete the acquisition of the replacement property within 180 days of the transfer or, if earlier, by the due date, including extensions, of your tax return for the tax year in which your property was transferred. During this period you aren’t allowed to receive the proceeds from the sale of your property. The property acquired in an exchange must be of equal or greater value to the one you gave up, and all of the net proceeds from the disposition of the relinquished property must be used to acquire the replacement property. Otherwise, any unused proceeds are taxable. With this basic information about 1031 exchanges, you may still be wondering whether an exchange is right in your situation. So let’s consider some of the advantages and disadvantages of exchanges. Tax deferral – The main reason most people choose to do a 1031 exchange is so taxes don’t have to be paid currently on the gain that would result from selling the property. The maximum federal tax rate paid on capital gains for most taxpayers is 15% (20% if you would otherwise be in the highest tax bracket of 39.6%). However, the part of the gain that is equal to the depreciation deduction you’ve claimed while you’ve owned the property is taxable at a maximum of 25%. Leveraging the tax savings – When an exchange is used, the money that doesn’t have to be spent to pay the taxes that would have been owed on the gain from a sale can be used to acquire other property or higher-value property. Asset accumulation – The money saved from not paying tax on the sale gain can be retained as part of your estate to be passed to your heirs, who would also get a new basis on the replacement property that is equal to its fair market value at your date of death. In this case, none of the postponed gain from the original property is ever subject to income tax. However, depending on the overall size of your estate, there could be estate tax considerations. Potential management relief – Taxpayers sometimes decide to sell their property to get out from under the burden of managing and maintaining the property. An exchange may still accomplish this without an outright sale by allowing the taxpayer to acquire replacement property that has fewer maintenance requirements and associated costs or has on-site management. Added complexity and expense – An exchange transaction involves more complexity than a straight sale. The timing requirements noted above must be strictly met or the transaction will be taxable. To avoid tainting the transaction when there’s a deferred exchange, the proceeds from the original property must not be received by the seller, and a qualified intermediary, also called an accommodator, must be hired to handle the money and acquire the replacement property. The intermediary’s fees will be in addition to the usual selling and purchase expenses incurred. Low tax basis – The tax basis on the property acquired reflects the deferred gain, so the basis for depreciation will be low. Thus, the annual depreciation deduction will often be much less than it would be if the property were purchased outright. Upon sale of the property, the accumulated tax deferrals will catch up, and the result will then be a large tax bill. No property flipping – The intent of the law permitting exchanges is for the taxpayer to continue to use the replacement property in his trade or business or as an investment. An immediate sale of the replacement property would not satisfy that requirement. How long must the replacement property be held? In most situations there is no specific guideline, but generally 2 years would probably suffice. “Intent” at the time of the exchange plays a major role according to the IRS. Unknown future law changes – When weighing whether to do a 1031 exchange, consider the known tax liability if you sold your property versus the unknown tax that will be owed on the deferred gain when you eventually sell the replacement property in the future. If you think tax rates may be higher in the future, you may decide to pay the tax when you sell your original property and be done with it. Recent proposals by various members of Congress and President Obama would severely curtail or even eliminate 1031 exchanges and increase the depreciation period of real property from 27.5 years for residential property and 39 years for commercial property to 43 years for both. These proposals may never pass, but they are an indicator of how 1031 exchanges are currently viewed in Washington, D.C.
1031 exchanges are very complex transactions, and the information provided is very basic. Before you commit to an exchange, please call this office so that we can review your particular situation with you. https://tarlow.com/wp-content/uploads/2016/05/logo.png 0 0 louadmin https://tarlow.com/wp-content/uploads/2016/05/logo.png louadmin2015-01-06 17:48:522015-01-06 17:48:52Is a 1031 Exchange Right for You? You’ll start this process by making sure that your QuickBooks file is set up to track inventory. Open the Editmenu and select Preferences, then Items & Inventory. Click the Company Preferences tab and click in the box in front of Inventory and purchase orders are activated if there isn’t a check in the box already. Here, too, you can ask that QuickBooks warn you when there isn’t enough inventory to sell. Click OK when you’re finished. In the example above, the box next to Subitem of has a check mark in it because “Light Pine” is only one of the cabinet types you sell (you can check this box and select <Add New> if you want to create a new “parent” item on the fly). 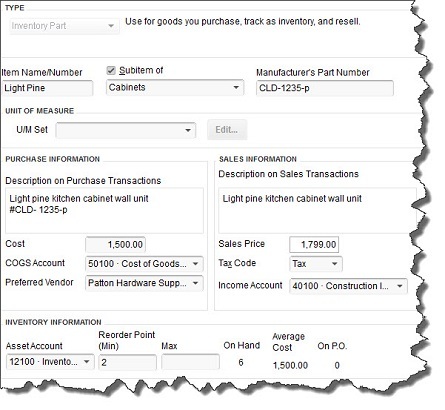 Leave the next field blank if your item doesn’t have a Part Number, and disregardUNIT OF MEASURE unless you’re using QuickBooks Premier or above. QuickBooks should have pre-selected your Asset Account. 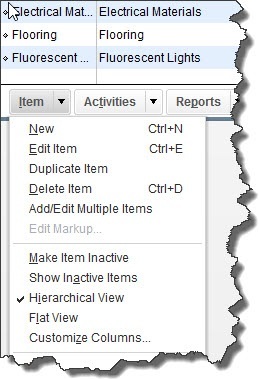 If you want to be alerted when your inventory level for this item has fallen to a specific number (Min) so you can reorder up to the point you specify in theMax field, enter those numbers there (the Inventory to Reorder option must be turned on in Edit | Preferences | Reminders).